Bones of Luna Park, originally uploaded by singingpixel. In 1907, a glittering amusement park called Luna Park was built out over the tidal flats of Duwamish Head in West Seattle. It sat out over the water on a pier, so you must picture it, reflected and suspended over the water. But concern over the “loose morals” it propounded led to its closure in 1913, and the swimming pavilion that was left of it was lost to arson around 1930. 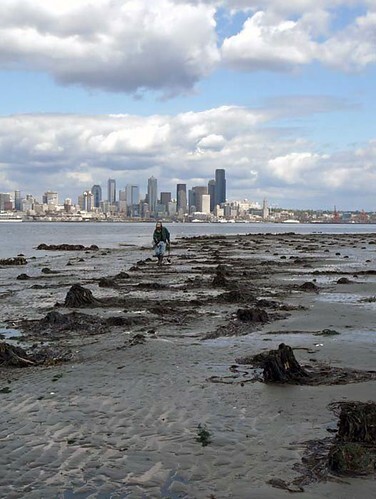 Approximately once in a decade, the waters of Elliot Bay draw back far enough to reveal the pilings that once supported Luna Park. I was lucky enough to be out with my camera one day in Summer 2009 when the bones of Luna Park were briefly revealed.